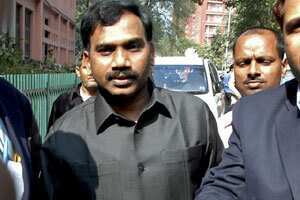 New Delhi: A plea by former telecom minister A. Raja that he would not cross-examine prosecution witnesses unless the CBI probe is over in 2G spectrum case, was dismissed on Friday by a Delhi court which began formal trial in the matter. “As soon as the investigation in this case, which started on 21 October 2009, is complete and all the statements as mandated in section 244 of the CrPC as supplied to the applicant, the right to recall the witnesses for cross examination will be exercised," Raja said in an application to the court. Appearing for Raja, senior advocate Sushil Kumar told the court that the CBI has apprised the Supreme Court that their investigation in connection with Loop Telecom is going on. He said the investigation in the case is going on as only one FIR has been registered by the CBI. The court, however, dismissed Raja’s plea and began recording the statement of the first prosecution witness.